Replacement of suspension struts in a Datsun 240Z can be accomplished with a few hours of your time, some inexpensive tools, and some good luck. The 240Z came originally with a piston rod & cylinder assembly that sat in a bath of hydraulic fluid within the strut assembly. Now days, everyone installs modern struts having fluid sealed in a pressurized canister. You can install stock or performance struts in your Z. The struts can be adjustable. This page addresses replacement if front struts. For a description of rear strut replacement, please go to Rear Strut Replacement. Tools required for the job include: a general metric tool set, a 10 mm tube wrench (not a cheap one), a set of spring compressors (about $20 a pair), a gland wrench (a 24-inch pipe wrench will work), a 4-inch bench vice (or maybe another pipe wrench to support the strut assembly during gland removal). A pneumatic (air) impact wrench really speeds up wheel removal and spring compression. A torque wrench is not expensive and no mechanic should be without one. Materials for the job include: new struts, motor oil, anti-seize lubricant (Never Seez), brake fluid. In the strut replacement shown in this description, Koni adjustable struts were installed front and back (only the front type strut was available so I had to modify the front struts for installation in the rear). A somewhat more expensive alternative is Tokico Premium Performance adjustable struts (Front: HZ3015, Rear: HZ3016). I chose adjustable so that I could tune the suspension to daily or racing stiffness, so the struts could be adjusted for optimum cooperation with the spring rate of the new springs I was installing, and so the struts could be adjusted as they wear out with time. I am very happy with my adjustable Koni struts because when they are set firm, the Yellow Z definitely tracks better, but the ride is jarring; set to soft, the ride goes back to the comfort I prefer on my commute to work. It only takes about 5 minutes to adjust the struts with a screwdriver from the top of the strut towers. I also replaced the stock springs with progressive springs during the strut replacement job. 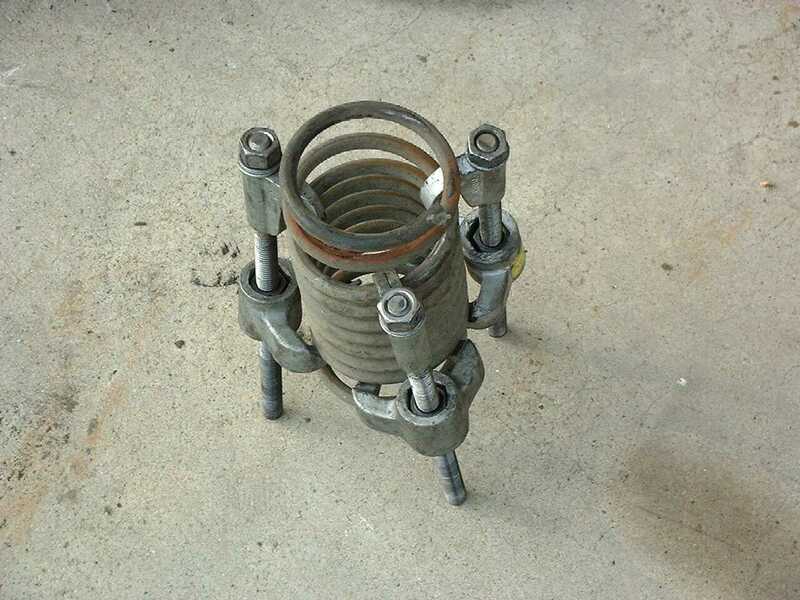 Progressive springs are wound with a soft spring section and a firm spring section. The progressive springs were supposed to be the best of both worlds - smooth down the road but firm in the turns. As it turned out, the softer section of the spring pretty much collapsed under the weight of my Z, so it dropped an inch in ride height without providing the soft ride. Over all, they are firmer, with less wheel travel than stock springs. I recommend stock or constant coil springs for better performance. Front struts can be removed in the order: 1) lift car, 2) remove wheel, 3) detach anti-sway bar, 4) detach compression rod, 5) detach steering tie rod, 6) detach brake line, 7) separate lower strut assembly from the transverse link, 8) detach strut mounting insulator from the strut tower, 9) remove the strut assembly from the wheel well, 10) compress the spring, 11) remove the self locking strut piston nut, 12) remove strut packing gland, 13) remove strut from strut assembly. For an image showing some of these parts click Front Well. Lift the Z Car. It is a good idea to loosen the lug nuts on wheels before jacking up the car. Be safe. Use redundant supports. I lift the car with a good floor jack, set the unibody on jack stands, and fill the space under the tires with lumber. Grab the car and shake it to see how secure it is. 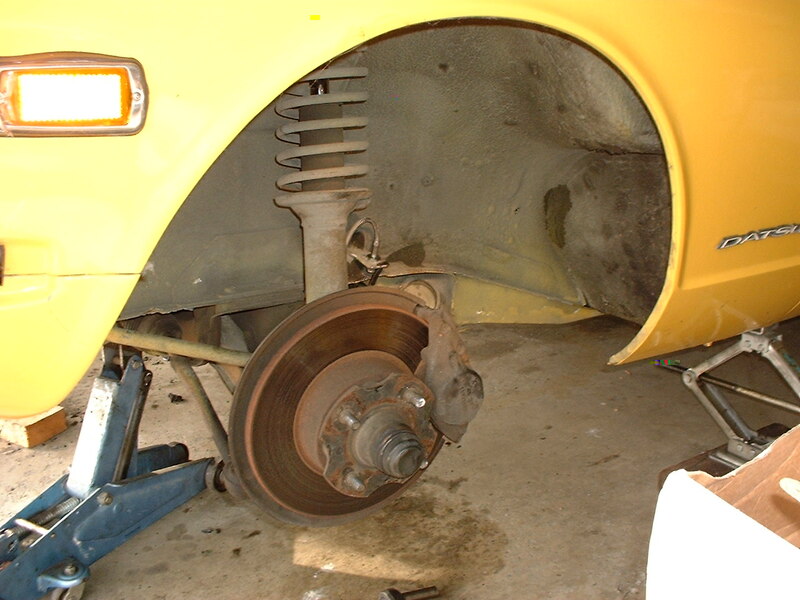 Remove the wheel associated with the strut you are working on; keep the other wheels on for safety. Removing the Strut Assembly from the Wheel Well. Detach the anti-sway bar and compression rods from where they bolt to the transverse link. These are just common nuts and bolts. Some penetrating oil can be useful to help loosen them. Separating the steering tie rod from the steering arm on the strut assembly can be difficult if it has not been done for a long time. Pull the carter pin from the castle nut and remove the nut. A special tie rod press can be used to force the tapered tie rod connection from the conical steering arm mounting hole. I have had good success using a ball joint separating fork tool to pry the tie rod from the steering arm. When desperate, I have replaced the castle nut with a solid nut to act as an impact head to strike with a hammer driving the tapered tie rod connection out of the steering arm hole. Separate the brake line where the solid line on the body attaches to the flexible line in the wheel well. Any time you work with brake lines in a 240Z, you are in danger of striping the connectors unless you use a good (Sears Craftsman®) 10 mm tube wrench; I once ruined a brake line using a cheap tube wrench. These connections commonly freeze up and are no fun to replace once destroyed. When the line has been disconnected, I use rubber vacuum hose plugs to stop the fluid from leaking out onto the floor. The strut assembly can be disconnected from the transverse link by removing the bolts going into the bottom of the ball joint. At this point, I usually put some 2x4s under the strut assembly so it wont fall when the three nuts at the top of the strut towers are removed to release the assembly. The strut assembly can now be removed from the wheel well. Removing the Strut from the Assembly. To remove the strut from the strut assembly, the spring must be compressed to take tension off the self locking strut piston nut. Inexpensive spring compressors come in pairs. I bought two pairs so I can use three compressors to compress one spring. If you only use two compressors, they tend to slide towards each other so the spring bulges dangerously to one side. The whole operation is more controlled and safe using three compressors. I use an air impact tool to drive the screws that compress the springs. This task is quite labor intensive and slow without air tools. With the spring compressed, the self locking strut piston nut can safely be removed without the strut assembly exploding like a vicious jack-in-the-box. It takes a lot of force to remove the self locking strut piston nut, so the whole assembly has to be held firmly in a vice or with your foot holding a pry bar wedged into the assembly. The nut can be removed without a firm hold on the assembly by using the sudden impact of an air impact driver. Observe the order and orientation of the parts (nut, strut mounting insulator, strut mount bearing, upper spring seat, spring, rubber boot) as they are removed from the assembly. With the naked strut assembly in a pipe vise (or in a pipe wrench, with a wedged pry bar, or with the assembly still attached to the transverse link in the wheel well), the strut packing gland can be turned off the assembly with a large pipe wrench. Sometimes this requires application of heat, application of penetrating oil, and/or striking the wrench with a mallet. With the packing gland removed, the old strut cartridge can slide easily from the strut assembly. On occasion, where the previous owner did not add cooling oil to the strut assembly before installation of the strut, I have had to rig a wench (come-along) to pull the old strut out. Reassembly. Reassembly is the reverse of assembly. Use Never Seez on all threads so there will be less trouble the next time the parts need disassembly. Add half a cup (about 150 ml) of oil into the strut assembly to help transfer heat out of the strut while driving down the road. Insert the new strut into the strut assembly. Carefully tighten the packing gland (without cross threading) to about 45 ft-lb (about 6 kg-m); add a spacer at the top or bottom of the assembly if the strut remains loose when the gland is turned all the way in. Replace the associated strut assembly parts (rubber boot, spring, upper spring seat, strut mount bearing (best to replace with new), strut mounting insulator, nut). Tighten the self locking strut piston nut to about 70 ft-lb (about 9 kg-m). Remove the spring compressors. Reinstall the strut assembly into the wheel well. I usually ask an assistant to help guide the 3 insulating mount studs through the appropriate holes in the top of the strut tower while I lift the assembly. The assistant quickly puts a nut on a stud as soon as it comes through the hole. 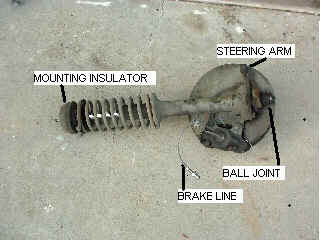 Reattach the transverse link to the strut assembly at the ball joint; bolts at 45 ft-lb (about 6 kg-m). Attach the compression rod; bolts at 45 ft-lb (about 6 kg-m). Attach the anti-sway bar and brake line. Mount the steering tie rod; tighten the castle nut to about 50 ft-lb (about 7 kg-m), replace the cotter pin. Bleed the brakes, mount the wheels, and align the wheels. I align my wheels by rolling the Z on a flat surface then adjusting the tie rods for a slight toe-in, as measured under the car with one of those spring loaded adjustable curtain rods.